Still a medical to be done! Don't jinx it! He's going to fail his medical now. Thanks a lot OP. So, when is he going to get his first injury? I reckon 5th game in, torn hamstring, out for 2 months. Bastian Schweinsteiger - never thought we'd actually see him in our kit. Ridiculous signing in a good way. Love the player, love the name. Been a fan for ages. Welcome to United. Will bring everything we need in our midfield. Crazy. Great signing. Top class hardened professional with a wealth of experience, and serial winner as well. He might not be the young player we all wanted and thus probably won't play week in week out for us, but if we can draw 30 appearances out of him, then with his undoubted quality and leadership skills, then he can be hugely influential for us next season. I expect though, that he will share the deep lying role with Carrick and only on occasions will play with him. I'm going for some German beer tomorrow. 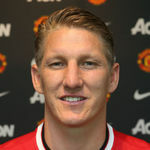 Welcome Bastian! I'm not even going to dismiss the announcement, as it's so awesome. This is incredible! All hail Woody! WTF! Send him back, we need to track his bleeding flight! To the Otamendi/Schneiderlin/Ramos/Oblak/Cherno Samba threads! Ed woodward du Transfer Gott!! ich liebe dich!!! Willkommen nach Manchester Bastian Schweinsteiger! We signed fecking Bastian Schweinsteiger!